Well THE GRINCH is out again in full force this year! That's right...the despicable, evil, sinister spirit that causes adults to act like rebellious children! 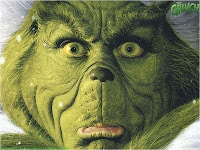 While I was preparing for Sunday's message at The Landing, "The Grinch", I am reminded about JOY. This is the season to be jolly, right? So what is going on? Why are police coming to Toys R Us to control unruly crowds and fights over....toys? 21-23"When a woman gives birth, she has a hard time, there's no getting around it. But when the baby is born, there is joy in the birth. This new life in the world wipes out memory of the pain. The sadness you have right now is similar to that pain, but the coming joy is also similar. When I see you again, you'll be full of joy, and it will be a joy no one can rob from you. That joy comes from our confidence in Christ who is the source of our joy. In fact, the joy of the Lord is our strength! Joy is a mind-set. Unhappiness is not knowing what you want and killing yourself to get it. Phillipians 4 says to “rejoice in the Lord always, and again(I repeat myself) rejoice!” Rejoice by choice! Don't let THE GRINCH get your joy!